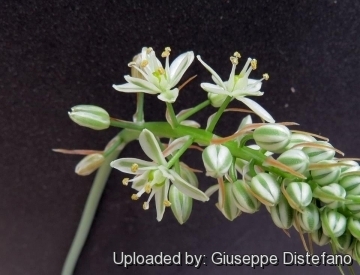 Description: Albuca bracteata, formerly known as Ornithogalum caudatum, is a peculiar bulbous plant often found among the collection of succulent fanciers, because of the green opalescent, exposed bulb with curious little bulblets that form on the bulb layers, causing 'pregnant' looking bumps until the layer sloughs off to reveal the bulblets. Inflorescences are spikes 70-90 cm tall, capped by small white fragrant flowers with green, central stripes, often produced in different seasons. 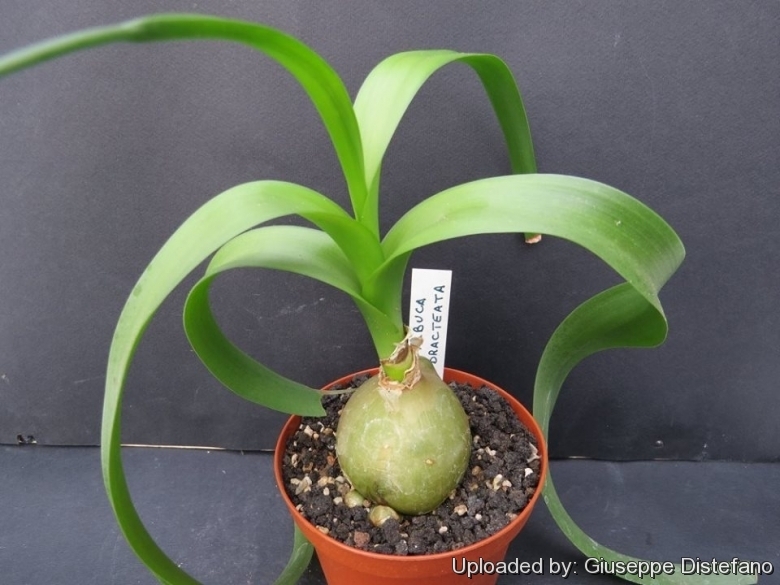 This bulb is better-known in cultivation as "Pregnant Onions" or "False Sea Onion" and is used as a houseplant. Habit: Ornithogalum caudatum it is a rather curious bulbous plant and looks very similar to an onion. It a classic cryptophyte (with bulb-like stem) that dies back during the dry period of the Mediterranean climate. Chromosome number: Albuca bracteata occours in different cytotypes 2n=54, 52. 15) Liepina, J. “False Sea Onion.” Zvaigzne ABC. Cultivation and Propagation: Albuca bracteata is an easy and adaptable plant to grow and it is well suited for containers growing happily in a pot for many years. It makes a good but odd houseplant or specimen. The albucas are increased naturally by the new bulbs. In general, they are plants of easy culture. Soil: In the greenhouse, use a suffice cactus soil with some peat (a soil that retains water yet drains well). Waterings: The plants are allowed to dry slightly in-between waterings. If the plants are allowed to dry too much, they will go dormant. The bulbs rest , leafless, during the dry summers of the Mediterranean climate, but can rest at any time of the year when water is suspended. Overwintering: During the winter months, the plants are allowed to go dormant and are stored in the cold storage until spring. Temperature: Reportedly hardy down to -5°C. Ethnobotanical/Economic Uses: Its crushed leaves when used as a poultice are an effective remedy for a number of ailments; for example, wrap around the neck to alleviate headaches and sore throats; for rheumatism apply to the painful areas and said to have healing effects similar to aloe vera. They are also efficacious in cases of blood poisoning, suppurations and serious insect stings. Also used as cooked syrup with rock candy against colds. Warning: Most parts of the plant are considered highly toxic. Contact dermatitis from the juicy sap can also be a problem for some people. The size and attractiveness of the little bulblets may pose a choking danger to children. In east Africa tribal groups recognized the toxicity of this plant. Propagation: Division, seeds, offsets (bulbils). Produces somatic embryos (bulbils) on the bulb scale tissue, visible as small bumps (pregnancies) on the surface of overlying bulb scales in mature specimens. These eventually fall off when outer scale layers disintegrate or split. After being shed, these root easily and begin new plants, often congesting the original plant unless moved to a new location or, as is very common, given away to unsuspecting fellow gardeners. For this reason, this plant is also a fun plant for grade-school projects. Copious seed is also produced and germinate easily. It is best to propagate seeds in the spring through summer in a mixture of moist peat and perlite. Cover the pot and plant with a plastic bag secured by a rubber band to prevent the moisture from escaping. Place in indirect sunlight or under a fluorescent light. Repot in its regular mix after it has been growing for a while. After dividing plant or removing offsets, pot it in its regular potting mix.